Despite improving to 10-1 last week in a wild win over the Kansas City Chiefs, the Los Angeles Rams are no longer sole favorites to win their conference on the NFC championship odds. The latest NFC futures have the Rams and the New Orleans Saints as co-favorites at +155. Both teams have only one loss so far this season. Furthermore, they both boast offenses that rank in the top three in the league. One thing does stand out for the Rams – their only loss this season came against the Saints. 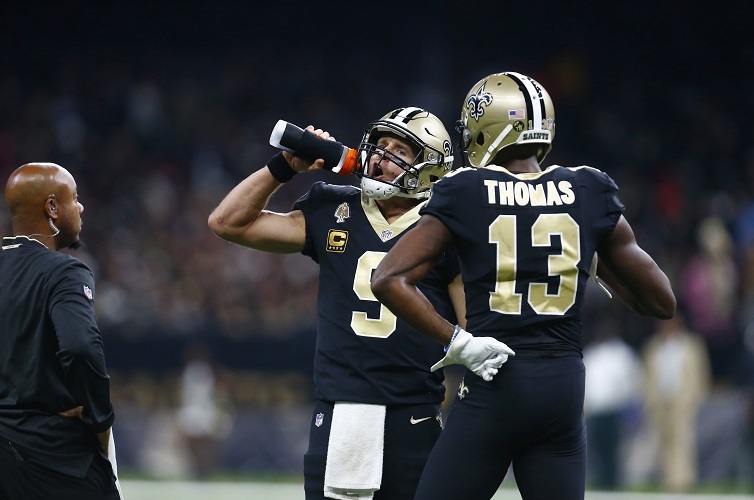 In Week 9, the Saints defeated the Rams 45-35 as a 2-point home underdog. Are the Rams and Saints destined to meet up again in the postseason? If so, expect the team with home field to have the edge. At home in the postseason, the Saints have won six straight, compared to a 1-7 record in their last eight playoff games on the road. The Rams are 5-2 in their last seven home playoff games and 3-6 in their last nine on the road. Looking at the remaining schedule for both teams, the Rams may have the easier road to home-field advantage. Los Angeles has only one game remaining against a team with a winning record. It also get to finish the season with back-to-back games against a pair of duds, the Arizona Cardinals and the San Francisco 49ers. The Saints have four games remaining against playoff contenders. This includes a home game against the Pittsburgh Steelers and two against the Carolina Panthers. Following the Rams and the Saints on the NFC championship odds are the Chicago Bears at +800. Chicago has steadily moved up the odds list throughout the season and appears to be legit after knocking off the Minnesota Vikings last week to hold onto top spot in the NFC North. Two things could derail the Bears’ rise. One, a recent shoulder injury to quarterback Mitchell Trubisky that has him considered questionable for this week. Two, four of the Bears’ remaining six games are on the road, and they’re 2-4 in their last six road games. Even Chicago’s home games are tough with the Rams and Vikings both heading to Chicago before the end of the season. The longer shots to take the NFC crown according to the oddsmakers are the Vikings at +1300 and the Green Bay Packers at +2000. The Vikings were a Super Bowl contender entering the season. Following last week’s loss to Chicago, however, they’re just clinging to the final NFC wild card spot at 5-4-1. The next three weeks could make or break the Vikings’ season. First, they face the Packers at home, followed by road games against the New England Patriots and the Seattle Seahawks. The Packers’ playoff chances are on life support, thanks to their 4-5-1 record. If they lose to Minnesota this week, they could be done. However, if they can upset the Vikings another late-season Aaron Rodgers-led miracle is possible. Four of their remaining five games appearing to be winnable against the Cardinals, Falcons, Jets and Lions.